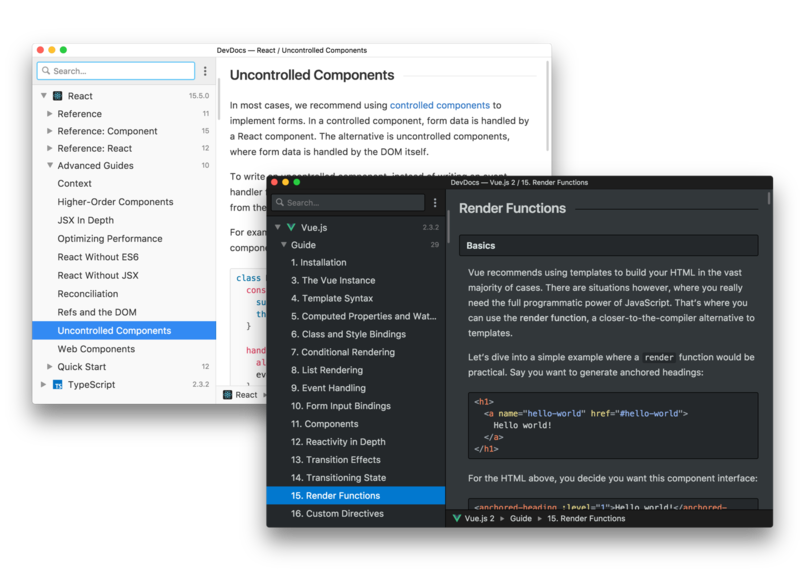 DevDocs.io combines multiple API documentations in a fast, organized, and searchable interface. This is an unofficial desktop app for it. When closing the window, the app will continue running in the background, in the dock on macOS and the tray on Linux/Windows. Right-click the dock/tray icon and choose Quit to completely quit the app. On macOS, click the dock icon to show the window. On Linux, right-click the tray icon and choose Toggle to toggle the window. On Windows, click the tray icon to toggle the window. devdocs the website itself has great built-in shortcuts support, just check the help page in the app. Use Ctrl+Shift+D (or Command+Shift+D on macOS) to toggle the app. # edit files, save, refresh and it&apos;s done.